New concepts in watch case design don’t come along too often. 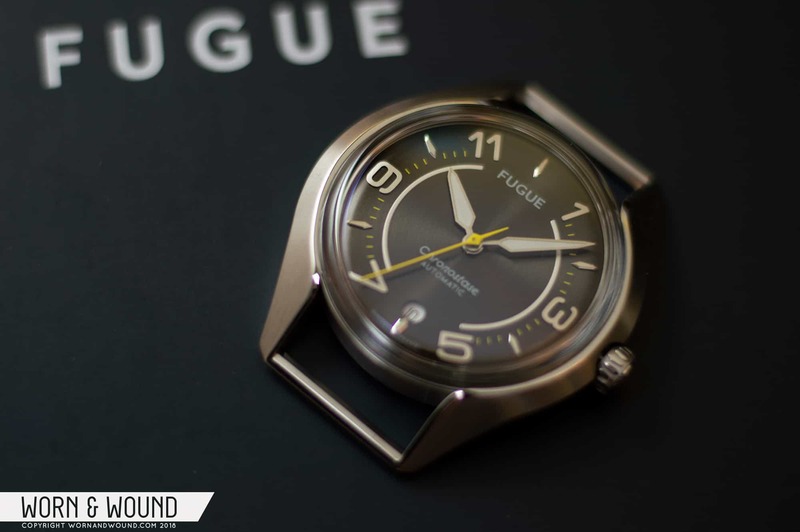 Although not entirely revolutionary, the modular case construction of the first model from young French brand Fugue does bring something fresh to the table. Launched last year, the Chronostase is a watch with some vintage flair and more customization options than meet the eye. Fugue take their name from the French word for “escape,” and it is described as an ode to taking a break from stressful daily routines. The more literal observation here is that the watch can be freed from its housing, but is this a gimmick or the next natural step in switching things up in the same way one does with straps? Let’s dive right in. Naturally, let us start with the atypical case construction. Instead of a single piece comprising the mid-case and lugs, the Chronostase splits into two distinct parts. The “case” is a rigid frame with long lugs and fixed bars at their tips. Everything else—crystal, case back, crown and all that lives within—comprise the watch “head,” which sits inside the frame and affixes via ball bearings and the accompanying seating. The head is inserted from beneath and is slightly wider than the frame. Extra security is given by the strap—which loops through the lugs—and also your wrist when the watch is worn. From my experience, I found that the fit of the case within the frame is snug enough that you shouldn’t need to worry about it staying in place. All in all, this modular system gives you the option of switching out the case even quicker than most conventional strap changes. The frame, rendered here in plated gold. Here you can see the seating for the bearings. The standard stainless steel case is a mix of vertical brushing lengthwise from lug-to-lug and polished sides. Additionally, the soft lip that runs along the inside of each lug and across the top edge of the case where it meets the watch head are also polished. Though this creates a similar roundness to the edges of the box crystal, it also gives a clear distinction between the two. The lower part of the watch head circumference is also brushed and forms part of a surface here that’s not often seen or appreciated in most watches. Owing to the long lugs and extreme positioning of the fixed bars, the space between the lugs is opened up and the view is pleasing. A small slither of the dial and raised indices can be seen through the side of the crystal before the heavy distortion around the edges of the crystal kick in. The case is 40 millimeters at its widest, and though the lugs look comparatively long, the lug-to-lug distance comes in at 47 millimeters. The watch head is 12 millimeters thick with the double-domed sapphire crystal sitting significantly above the outer case and the solid case back also protruding slightly beneath. As a result, the watch feels slightly slimmer than the specs would suggest. Four dial options available for the Chronostase. Seen here is the Black Metal variant with the others labeled as Silver Grey, Ocean White, and Vintage Navy. The pronounced circular brushing gives the black dial a slate grey appearance in some light. The dial markings echo the curve of the case sides with two prominent arcs running inside the hour and minute markers on the left and right hand side of the dial. These arcs, as well as the Arabic numerals marking out each odd hour, are applied and given a silvery finish across the top. The detailing is very nice, but I would have wished them to have been given the same strong coating of C3 Super-LumiNova as seen on the hands. Having only the hour and minute hands lumed is probably sufficient, but having those stylish Arabic numerals and inner arcs also visible in the dark would have been a nice touch. The dial has a pleasing mix of textures and finishes. Between the Arabic numerals are polished, chamfered indices to mark out the even hours. Although the circular date window at the bottom of the dial encroaches a little on the index at six o’clock I’m pleased to see that neither is compromised. The index extends into, and floats above, the date wheel without obscuring it. At the top of the dial, the FUGUE name appears higher up than it might normally be positioned, but this works well to fill the space between the arcs on either side. On this dial variant, and also on the Silver Grey, the pops of yellow from the second hand and minute markers give it a bit of verve. On the other two dial variants, the yellow is substituted by a vibrant blue. The Fugue Chronostase is powered by the Sellita SW200-1 in Elaboré grade. This automatic caliber is almost identical to the widely known ETA 2824-2 and so it has largely the same specs: 28,800 beats per hour, a 38-hour power reserve, hacking and hand-winding. As is my preference, I’m happy to see a nicely designed and engraved case-back rather than a movement without a very high level of finishing. Initially I was concerned about how the watch was going to wear with the modest diameter and seemingly lengthy lugs. I needn’t have worried. The long lugs are a feature of the design, but not a problem in how the watch wears. Indeed, the lug-to-lug length is entirely in keeping with the case diameter. Visually, lugs that extend a long way from the case tend to be less noticeable when worn with single pass straps, which are required here. The watch comes supplied on your choice of Italian leather strap. Seen here is the beige option, but you can also opt for black, brown or marine blue. The leather is soft and supple straight out of the box, with padding on the inside not often seen on single pass leather straps. As customization is a big part of the watch, it’s great to see that an additional case and strap are also included in the package. The case options are either a gold plated case or black plated case, and the additional strap is your choice of four different colors of perlon, all complete with a Fugue branded tang buckle. A gold plated case wouldn’t normally be my choice, and this is probably the first time I can remember a gold tone case sitting on my wrist, but combined with the retro hints on the dial and paired with a black perlon strap it really is quite a sharp look. With a total of 96 different watch/case/strap combinations, you can choose the perfect one for you, but with this particular dial I would be itching to try out a black plated case with a yellow perlon strap.